People dealing with difficult conditions such as Alzheimer’s and dementia often require special assistance in a well-equipped environment that provides proper personal care. The best senior care facility in Texas has 16 high-quality, private and semi-private rooms. They never overbook and they have an impressive ratio of one licensed caregiver for every five residents—which means your loved one is guaranteed to be provided more-than-enough attention and care. Note that many states around the country do not have official regulations when it comes to staffing ratios in senior care facilities, but the best ones maintain a high staffing ratio despite this. Their commitment to providing high quality, personalized care makes them stand out above the rest. The best assisted living facilities make your loved one feel at home, relaxed, and comfortable. They place importance on freedom and independence, so residents are free to roam around in the well-maintained outdoor paths while remaining secure and safe. From morning until evening, every resident is well taken care of. Their medication is reliably managed and the staff also provides regular laundry, and housekeeping services. An in-house physician regularly checks up on every single resident, and outside specialists are regularly invited. Their friendly and professional staff is trained to assist your loved one with anything and everything they need. 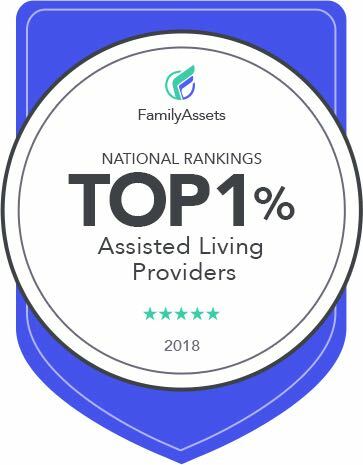 Top-notch assisted living facilities believe in a holistic approach This means that all of their patients’ needs—mentally, socially, physically, and emotionally—are met. The home-cooked meals the facility provides are well-thought out to meet the nutritional requirements of the residents. Frequent activities keep everybody engaged socially and cognitively. The homelike environment of the facility and the small community give your loved ones independence, dignity, and love that they deserve. These assisted living facilities also provide physical therapy and nutrition and hydration programs that help people with dementia or Alzheimer’s stay healthy. Their round-the-clock security ensures that everyone is secure inside the facility.